John Potash’s recent book, Drugs As Weapons Against Us: The CIA’s Murderous Targeting of SDS, Panthers, Hendrix, Lennon, Cobain, Tupac and other Activists, was published in May of 2015, with the corresponding documentary released just this past January (2019), titled, Drugs as Weapons Against Us: The CIA War on Musicians and Activists. Both have been received extremely positively, pulling together a host of historical facts, analyses, and thorough research, resulting in a well-presented stance that certainly holds water. It is also important to mention that he has worked as a counsellor for people with mental health problems and addictions for over 25 years now. So he is certainly no newcomer or sideline spectator when it comes to this topic. Posted on April 7, 2019 by Genevieve Yu Wey. We recently had the exciting opportunity of interviewing Jeremy Kenyon Lockyer Corbell, a man of many talents and with quite the brain to pick. Born in 1977 in Los Angeles, he is known as a contemporary artist, an investigative filmmaker, while also boasting a martial arts career (with a black belt in Jujitsu). Though all equally fascinating, we were focusing on only one of his three artistic outlets in this interview, namely his filmmaking. Corbell’s investigative documentaries have garnered considerable attention in recent years, particularly amongst truth-seekers, fringe communities, believers -- call them what you will. Essentially, people aiming to expand their consciousness and sphere of knowledge. His two most recent releases are Hunt for the Skinwalker (based on a book by George Knapp and Dr. Colm Kelleher), and Bob Lazar : Area 51 & Flying Saucers. The latter was the spotlight of our discussion. So, what do we know about Bob Lazar? Well, he went public in 1989, appearing in an interview with investigative reporter, George Knapp, on the Las Vegas TV station, KLAS. He was presented with his face hidden and under a pseudonym (Dennis). He claims that he back-engineered an alien spacecraft for the United States Military, and that this spacecraft had an incredibly advanced (that is, advanced to us humans) propulsion system. Specifically, a propulsion system that used gravity wave propulsion (fueled by atomic element 115 — Moscovium — first synthesised in 2003). A great example that appeared in the documentary was approximately as follows: imagine a ball; it’s on a bed, and you want to move it forward; you push the mattress down, and it rolls towards the indent; you did not push it, blow at it, nor anything else that involves a *push* type of propulsion from its back. This is a good, approximate way to imagine this gravity wave system. Also, another thing we know: Lazar is known to be a little difficult to get a hold of. That is, he’s quite content keeping out of the public eye, making any significant communication with him rather exciting and valuable. This is where Corbel comes into the picture, because that’s exactly what he managed to do for this documentary. The film follows Corbell and his interactions with Lazar, playing out much like an in-depth and extended interview; thus, we are brought into a world of Area 51 secrets and the whistleblowing of covert government projects. 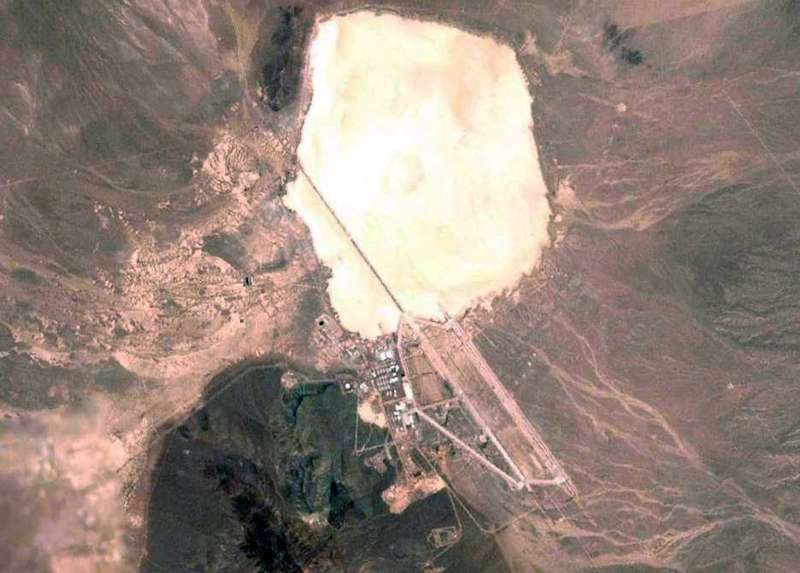 Areal view of Area 51 located in Lincoln County, Nevada. The movie is a feature length documentary focusing on the claims of Bob Lazar: what his work involved at S-4; what exactly he discovered there; how he interpreted the things he saw. We also get a glimpse of how his past involvements affect his current life: it becomes clear that his link to the government will never completely disappear, whether he wants that or not. This documentary is part of an expanding series titled, Extraordinary Lives. In this series, Corbell explores the beliefs and stories of people deep within various networks: aerospace, military, conspiracy, extraterrestrial, and underworld communities. Specific topics include: advanced nano-technology, non-lethal weaponry, off-world technologies, space travel, and extraterrestrial contact. We rather enjoyed Corbell’s documentary prior to this one, Hunt for the Skinwalker, and urge any newcomers of these realms to explore some of these movies. In our interview, we also explore Lazar’s education, and why there seems to be a lack of a paper-trail leading to it; how, indeed, Corbell got Lazar to talk on Camera; and evidence that works in favour of Lazar’s claims. We hope you enjoy this interview, and proceed to explore this subject matter further. Jeremy Corbell’s documentary, Bob Lazar: Area 51 & Flying Saucers is available on Amazon and iTunes. Don’t forget to visit Jeremy’s website, Extraordinary Beliefs, for more information. Spread The Word & Spread The Love! Posted on March 6, 2019 by Genevieve Yu Wey. On this edition of WoTR, we focus on Brad’s book, Future Esoteric: The Unseen Realms, as well as delve into some other related topics. We question him about his very own “red pill” moment, including when and where it took place, and how it changed him. We also discuss some of his top “sacred sites,” what types of locations they are, and what makes them so special. We then move on to talk about UFOs and classified government projects, asking him about his own experience with UFOs, his thoughts on hidden underground cities and military bases, and the connection to the Third Reich when it comes to “flying saucers” and secret space programs. Posted on November 5, 2018 by Genevieve Yu Wey. Kathleen Marden is an author, extraterrestrial-intelligence researcher, and most popularly known as the niece of Betty & Barney Hill. To most people that have researched the UFO phenomenon even just a bit, the Betty & Barney Hill case is very likely one that the majority of you have stumbled across. Kathleen is an activist for contactees and experiencers across the globe, and hopes to make the subject more known, lessening the negative stigma attached to such incidents and topics. She is the Director of Experiencer Research at MUFON (Mutual UFO Network), as well as the author of several books (five to date). Posted on August 23, 2018 by Genevieve Yu Wey and filed under SUM3. Science, Magic, & Symbols with Ryan Gable, Host of "The Secret Teachings." At this year's Contact In The Desert Conference, we sat down with Ryan Gable, host of the radio show, "The Secret Teachings," to get his take on all things occult, including the relationship between science and magic, as well as the power of symbols, and the benefits and pitfalls of these practices. We asked him about the possible nefarious goals of CERN, and we also discussed Manly P. Hall's legendary work, "The Secret Teachings of All Ages." We furthermore reviewed the occult practices of rocket scientist, and subject of the brand new CBS All Access series, "Strange Angel," Jack Parsons. Enjoy! Posted on June 22, 2018 by Frank Argueta and filed under SUM3. Dr. Robert Schoch is best known for his research and claims regarding the Great Sphinx of Giza – like the pyramids of Giza, many of us take the Sphinx and its history for granted. That is, we assume we know the basics: it’s in Egypt; it has the body of a lion and the head of a man; and it was built by the ancient Egyptians of the Old Kingdom. However, what Dr. Schoch and his colleagues propose is a rather different theory, suggesting that the Sphinx is likely far older than we have always believed it to be, therefore meaning it must have been created under different conditions and by different people than originally assumed. The journey of his research is absolutely fascinating, and we were excited to pick his brains on this topic. Posted on May 30, 2018 by Genevieve Yu Wey and filed under SUM3. Posted on May 5, 2018 by Genevieve Yu Wey and filed under SUM3. Mantra: Sounds into Silence is an inspirational documentary, there is no doubt about that. Whether this is your spiritual cup-of-tea or not, it’s still certainly an insightful and interesting movie, and something that we can all learn from. The documentary walks you through the various back-stories of the people that were guided towards this type of lifestyle and meditation. It is deeply entwined with yoga (different types, e.g. Kundalini Yoga, Bhakti Yoga), and all of these people appear to have self-reflected and realised that there was something missing in their lives. This void was filled by mantras and the spiritual lifestyle that came with it. Posted on April 5, 2018 by Genevieve Yu Wey and filed under SUM3. What do a lonely Scottish manor at the edge of Loch Ness, a notorious occultist and ceremonial magician, and possibly the most influential rock band ever, have in common? Apparently, quite a bit. Jimmy Page has never been subtle about his fascination with the dark and mysterious, and though many Led Zeppelin fans believe that the band’s involvement with anything occult-related went only so far as being a stage show, there is likely to be more than meets the eye. Lance Gilbert, author of, “The Led Zeppelin Curse: Jimmy Page and the Haunted Boleskine House,” is here on West of The Rockies to enlighten us a little about the link between Led Zeppelin and the world of magickand rituals, through his thorough research, as well as personal experiences. Posted on February 16, 2018 by Genevieve Yu Wey and filed under SUM3. Walter Bosley is back for another show on West of The Rockies, this time round being interviewed on his first official non-fiction book, Latitude 33: Key to the Kingdom. The book explores the underlying esoteric themes of Disneyland (California), focusing on its design and geographical location, particularly the placement and set-up of certain rides. Posted on February 8, 2018 by Genevieve Yu Wey and filed under SUM3. This last Friday, February 2nd, saw an exciting leap in science, archeology, and history at LA’s “Where Are They From?” presentation, revealing the DNA results of the ancient Paracas elongated skulls. Posted on February 4, 2018 by Genevieve Yu Wey and filed under SUM3. It’s been a question that has been floating around for years now, and only occasionally sees coverage in mainstream news and media: how bad are WiFi signals really? We’ve heard horror stories, of course — when it comes to EMF, there is not lack of them. People who have worked as air traffic controllers showing higher occurrences of cancer; “leaking” microwaves making people ill; keeping your phone in your pocket making you infertile. We all know the drill at this point. Generally, it’s fair to say, WiFi waves have been seen as a negative thing for a while now. Posted on November 22, 2017 by Genevieve Yu Wey and filed under SUM3. Stan Lee's Los Angeles Comic Con 2017: From The Rock To The Black Eyed Peas, Smell What Was Cooking! Didn’t get to attend Stan Lee’s LA Comic Con this year? Or want a little nostalgic refresher to alleviate the decompression process after the event? Here’s our walk-through of all things fun and fantastic at this year’s LA Comic Con! Posted on November 16, 2017 by Genevieve Yu Wey and filed under SUM3. Last Sunday, we had the pleasure of interviewing Walter Bosley, popular conspiracy author, meticulous researcher, and ex-Special Agent of various government-related organisations. Specifically, he spent nineteen years in national security, having been employed by the FBI; by the US Air Force, working as an inactive reserve officer (where he also served as a Special Agent of the AFOSI on active duty); and also working as a counterterrorism operational consultant for six years following military service. Posted on September 10, 2017 by Genevieve Yu Wey and filed under SUM3. Posted on August 16, 2017 by Genevieve Yu Wey and filed under SUM3. Jake Anderson is a writer and filmmaker, originally hailing from Arkansas, but currently residing in Portland, Oregon. He received his Bachelor's Degree in Film and Digital Media from the University of California at Santa Cruz, and gained an impressive repertoire of experience working the scenes of Hollywood. He has written numerous screenplays, short stories, and creative non-fiction works, and has also worked on many-a-film, including “Evan Almighty”, “Transformers 3”, and, “The Immortalists”. He is also a freelance writer for theantimedia.org, as well as Director for TheGhostDiaries.com, a brilliant online portal for all those interested in the latest paranormal findings. Posted on July 6, 2017 by Genevieve Yu Wey and filed under SUM3. Probably one of the greatest mysteries of the music world, the story of Jim Sullivan remains just as fascinating and baffling as it was back in 1975. On this edition of the show (a classic that we've dug up from a few years ago) we have the pleasure of speaking to Matt Sullivan (strangely enough, absolutely no blood-relation to Jim Sullivan), who is the founder and co-owner of Light In The Attic Records. LITA Records saw its first seeds sewn in a little basement apartment in Fremont, Seattle, back in 2001, and has since provided us with some fantastic re-issued gems by artists such as Sixto Rodriguez (whose fame blew up with the Oscar-winning movie, Searching For Sugarman); produced enlightening documentaries such as Wheedle’s Groove; and pushed our boundaries of traditional music by presenting us with releases such as the Native North American Archival series. Jim Sullivan was one of the “long lost gem” discoveries by LITA. Posted on July 5, 2017 by Genevieve Yu Wey and filed under SUM3. Contact In The Desert. To call it a “UFO Convention” would in no way do it justice, nor would it be accurate. I generally find myself a bit stuck trying to find the right words to describe this annual event to my friends and family. Sometimes these types of gatherings are called “consciousness expanding” conferences, or words to that effect. But then again, it’s more than that. Their own website describes the event as “An EPIC weekend of exploration into extraterrestrial life, ancient aliens, human origins, secret space program, crop circles, UFO sightings, contact experiences, interstellar living, and the “need to know”.” So we’ll go with that for now. Posted on May 31, 2017 by Genevieve Yu Wey and filed under SUM3.